Cuddle up with a French bulldog to celebrate. After her death in December, Carrie Fisher may yet add an Emmy award to her list of many accomplishments. 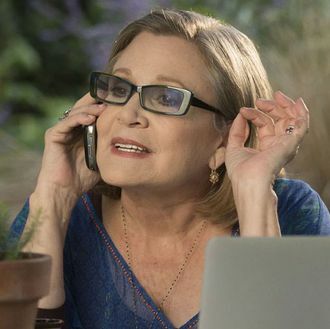 The Star Wars actress received a posthumous Emmy nomination for Outstanding Guest Actress in a Comedy for her work as Rob Delaney’s caustic mother on the third season of Catastrophe this morning. It’s Fisher’s third Emmy nomination, following a 2011 nomination for her variety special Wishful Drinking, and a 2008 nomination for her guest appearance on 30 Rock. Catastrophe creator Sharon Horgan reacted to the news on Twitter, writing, “Very happy and sad and proud and messed up and delighted about our friend Carrie Fisher’s nomination.” Fisher earned Catastrophe’s only nomination this year, though the show received a writing nomination last year for its pilot.